Skeema is a pure-SQL schema management utility. Simply track your desired schema state in a repo of CREATE TABLE statements, and the tool figures out how to apply any changes to your databases. You won't need to code migrations, use obscure DSLs, or write verbose XML ever again. 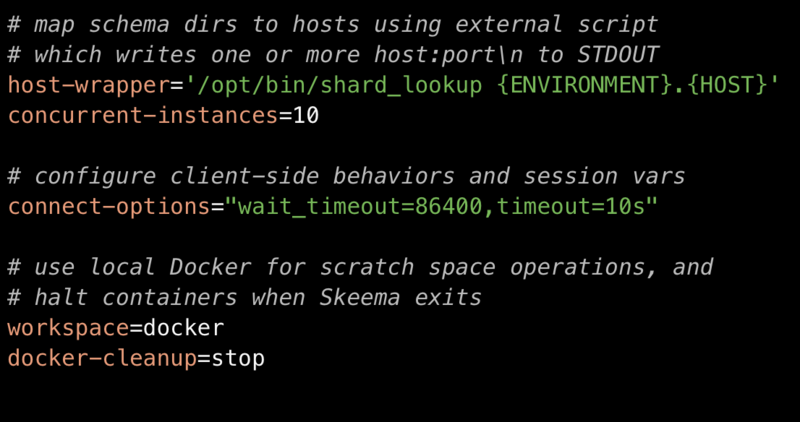 Skeema’s CLI tool is free and open source. Written in Golang, it’s a native binary with no system dependencies. Supports all modern versions of MySQL, MariaDB, and Percona Server. 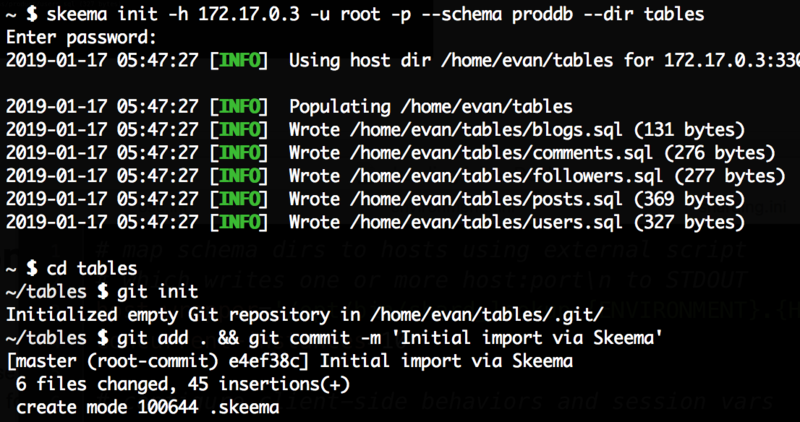 Skeema makes it easy to get started with tracking your table definitions in a repo. Each .sql file contains a CREATE TABLE statement, and each directory has a .skeema config file controlling options for one logical schema. Simply modify the CREATE TABLE statements in your schema files, or add new ones. 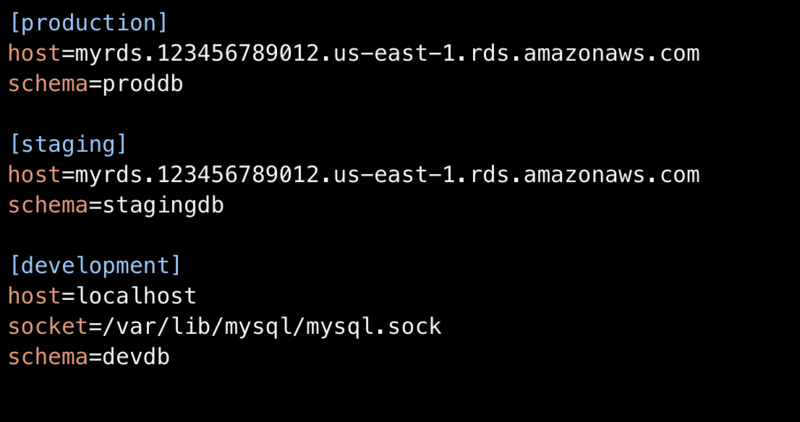 Skeema generates SQL DDL statements to reach the state expressed by the files. Configure any number of named environments — e.g. separate development, staging, or production systems. A single skeema push can bring any environment up-to-date, regardless of what state it’s in. Have large tables? 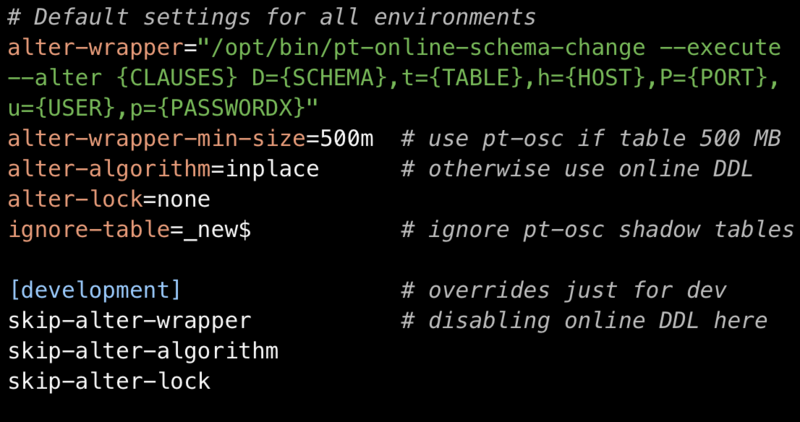 Skeema can optionally use external tools like pt-online-schema-change, or built-in MySQL options for online DDL. You can even configure different execution methods depending on table size, schema, cluster, or environment. Whether you have just a single DB instance or complex sharded topology, Skeema's configuration system is designed to scale to your requirements.